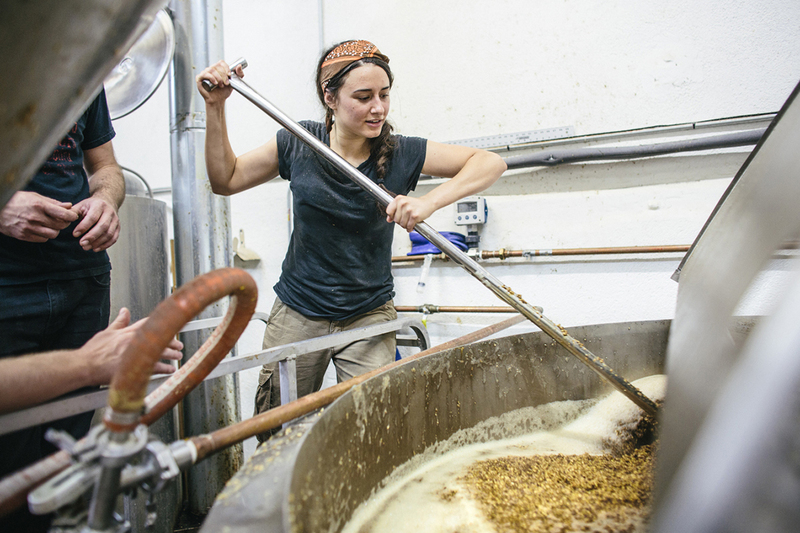 Pipeworks Brewing’s Kate Brankin stirs the mash for Brown & Stirred, the brewery’s cocktail-inspired beer collaboration with Longman & Eagle. Beer cocktails have become a staple on bar menus around the country, but a new crossover between the beer and bartending worlds has started emerging in breweries: beers inspired by the flavor profiles and recipes of cocktails. Since the original collaboration, Pipeworks has experimented with other cocktail inspirations as well, ranging from the Mojito (Mojito Madness features mint, coconut and key lime juice) to the White Russian (Hey, Careful Man, There’s a Beverage Here was an Imperial White Russian Stout made with cacao nibs, vanilla beans and Dark Matter Coffee). The creativity of collaboration also inspired Perennial Artisan Ales’ annual Dealer’s Choice series of cocktail-inspired brews. The first release was a tart golden ale brewed with key lime and herbs created in conjunction with Aviary in Chicago as an homage to the classic Last Word, and the most recent experiment with Jack Rose in Washington, D.C. yielded a beer-cider hybrid ale inspired by the bar’s namesake cocktail. For brewer Jonathan Moxey, the experiments are a chance to challenge his routine and stretch his skills. 0 1 1 5 1 Total: 8 Pechuga, pineapple juice and a little spice form this unique sipper from Dave Witton of Villains Tavern….